Larry Thomas remembers not knowing exactly what to say or how to respond. 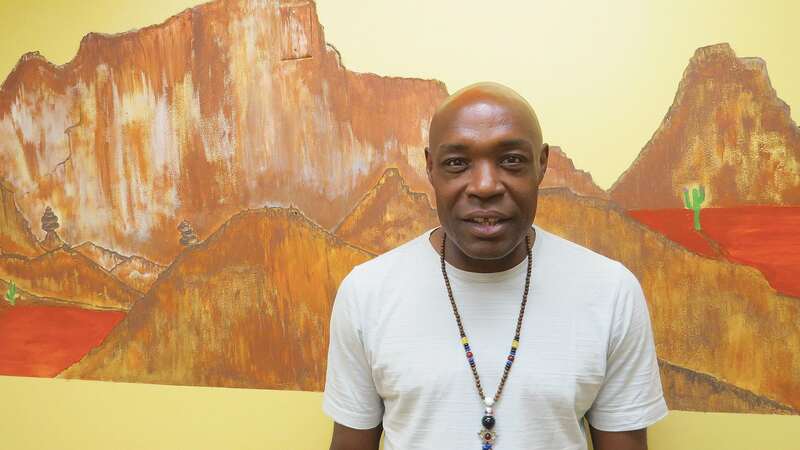 He had just been encouraged to apply for a job as a peer coordinator and recovery coach for something called the Recover Project, a recovery support center operating in downtown Greenfield under the umbrella of the Western Mass. Training Consortium and funded by the Bureau of Substance Abuse Services in Massachusetts. Thomas paused, because the last job he held was as part of a work-release program operated by the Department of Corrections. Thomas, in applying and then earning the job, essentially put his past behind him and focused on solidifying his future, which is, by and large, what he encourages others to do as a recovery coach. He takes his ‘lived experience’ — that’s a phrase you’ll read often in this article — and puts it to work helping others combating addiction and trying to put their lives back together. Thus, he’s become part of a huge, multi-faceted, truly groundbreaking collaboration forged by the Western Mass. Training Consortium and the Opioid Task Force of Franklin County and the North Quabbin Region. Actually, he was part of it before he became an employee, as we’ll see. But first, by ‘huge collaboration,’ we mean more than 300 public and private partners, representing law enforcement, the healthcare community, the court system, a host of nonprofit agencies such as the Recover Project, addiction specialists, and addicts themselves. Collectively, these partners have one overriding mission — to save lives. Sahern Ahern says she learned that, when it comes to addiction, a community has to make change from the inside out. And they are doing just that by effectively bringing an entire community together to combat a problem that that is prevalent across the country, but especially in rural areas like Franklin County. As John Merrigan, register of Franklin Probate and Family Court, recalls, in the summer of 2013, all those players were essentially confronting the opioid epidemic separately and in their own ways — and not making much headway, really. By the end of the year, they were confronting it together, collaborating, communicating, building bridges, combining resources, and fighting the problem not by locking people up but by using lived experiences, peer-to-peer counseling, and even massage and acupuncture to help them find a pathway (another word you’ll read often) to treatment and recovery. 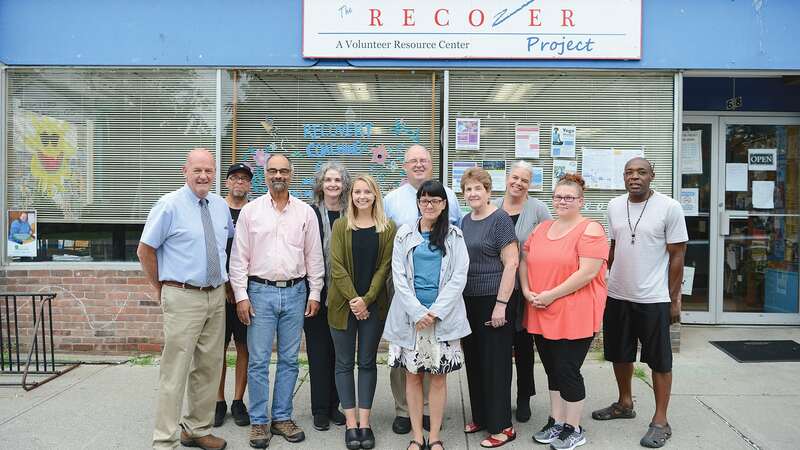 As they talked with BusinessWest about the collaboration at the Recover Project’s facility on Federal Street in Greenfield, the many assembled players spoke with one voice about the power of such peer-to-peer counseling and the even greater power of a community coming together to address a problem that has touched everyone in that community directly. Sarah Ahern, another peer leader and recovery coach, lost two family members to overdose, and remembers feeling a wide range of emotions, but especially anger at a system she felt had failed miserably to prevent such a tragedy. “I’m that person who decided to bang on the doors from the outside, because I was really angry, and I saw the system was broken,” she recalled. “But someone told me — and I’m pretty sure it was someone here at the Recover Center — you can’t make change that way; you have to make change from the inside out. ‘Creating change from the inside out.’ That’s one way of describing what this collaboration is doing. But there are many others. David Sullivan, Northwestern district attorney, had his own way. In most all ways, this collaborative effort is creative and truly cutting-edge in its approach to combating opioid and heroin addiction. And it is becoming a model that other community task forces are trying to emulate. Indeed, individuals and groups from across the Commonwealth as well as other New England states, New York, and Ohio have reached out to learn more about this collaboration and its unique approach. The crisis is far from over, said all those we spoke with. But they were also in agreement that the energy and, more importantly, the hope created to date is fueling general optimism in a region where that commodity has been in short supply in recent years. And for generating that optimism, all those involved in this collaborative are true Healthcare Heroes. Anthony Bourdain, the colorful host of the Parts Unknown series who tragically took his own life earlier this year, came to Franklin County in the fall of 2014 to learn about the task force and the many players involved in this collaboration. Indeed, in a small community like this, almost everyone has a family member, friend, or co-worker who is addicted to opioids or has overdosed. And this closeness to the problem, this familiarity with tragedy, certainly helped bring people together behind that mission to save lives, said Merrigan. That response started with a phone call he placed to Linda Sarage, then the director of the Recover Project, and a request — more like a plea — to start a dialogue, something that didn’t exist between the two entities before that call. Larry Thomas says he was hesitant to apply for a position as recovery coach, because the last time he held any kind of job, he was still in prison. Those initial talks led to many more and eventually what D.A. Sullivan called an epiphany about the importance and power of recovery communities to finding a long-term solution to the addiction problem. Which brings him to the subject of lived experience and recovery coaches like Larry Thomas, who are, Sullivan said, some of the real keys to changing the equation in this ongoing battle. “A lot of what’s happened in our society is that people are looked at as if they’re broken and they need to be fixed,” she explained. “And we feel like a lot of that is response to life and what’s going on in the world. The opposite of addiction is connection; you can’t separate out people and say, ‘what can we do to tinker with you and fix you?’ That’s a fundamental flaw in the way we go about things. “So we try to turn the tables on that,” she went on, adding that the next key part of that phrase is ‘lived experience.’ Everyone has it, she said, and there are proven benefits to bringing people together who can share common experiences, whether its addiction, domestic violence, or significant health issues. Then, there’s the ‘strengthen our communities through full participation’ part of that phrase, she told BusinessWest, echoing Sullivan and others when she said that the community is much stronger when people like Larry Thomas are involved with helping others and not incarcerated. As she talked, as others did, about the many ways the collaborative is changing the fight against addiction and generating momentum and progress, McLaughlin said groups working together can achieve much more than individuals and groups working independently of one another. “We’ve been able to do things we wouldn’t be able to do ourselves,” she said, offering as examples everything from a ‘Building a Resilient Community’ event that focused on the role of trauma in one’s life, to a toiletry drive for individuals in recovery — an initiative that involved five locations, with donated items distributed to nine different organizations — to a recovery-friendly resource fair called ‘Where to Turn?’ involving more than 30 nonprofit agencies from the Greenfield, Franklin County, and North Quabbin areas. 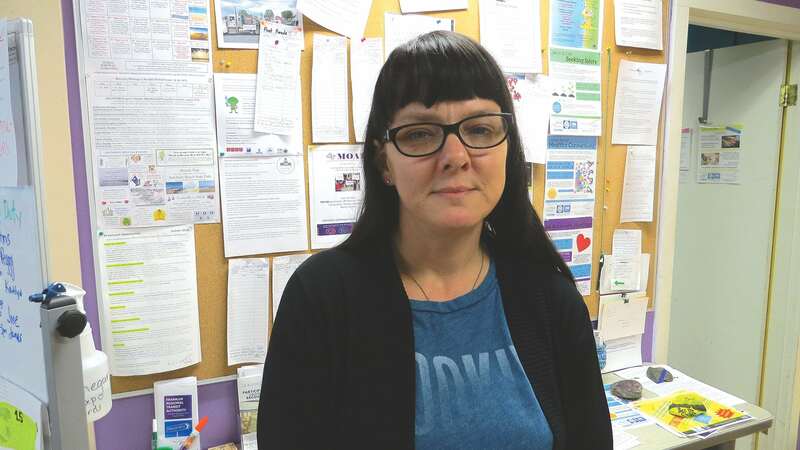 And those represent just the tip of the iceberg, she said, adding that there have been a host of other initiatives ranging from a ‘bowling for recovery’ event to a program focused on recovery during the holidays. This support takes many forms, from peer-to-peer counseling to a theater program, to the People’s Medicine Project, an emerging program of the consortium. This is a small but committed group of alternative-health practitioners, gardeners, social-justice advocates, and community members who believe that all people have a right to wellness and an empowered connection to their health. 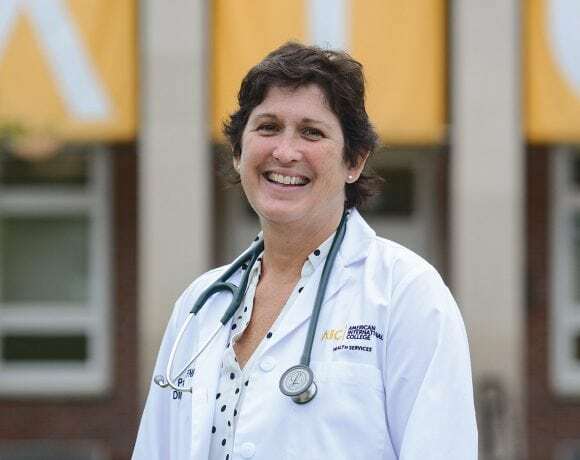 Leslie Chaison, director of the project, said one of its main goals is to focus attention on the problem of pain and, more specifically, the over-prescription of opioid medications and the need to help people discover alternatives. Through a grant from the task force, the project forged a partnership with Greenfield Community Acupuncture that has enabled a number of early-stage recovery individuals to receive acupuncture treatment for their pain. 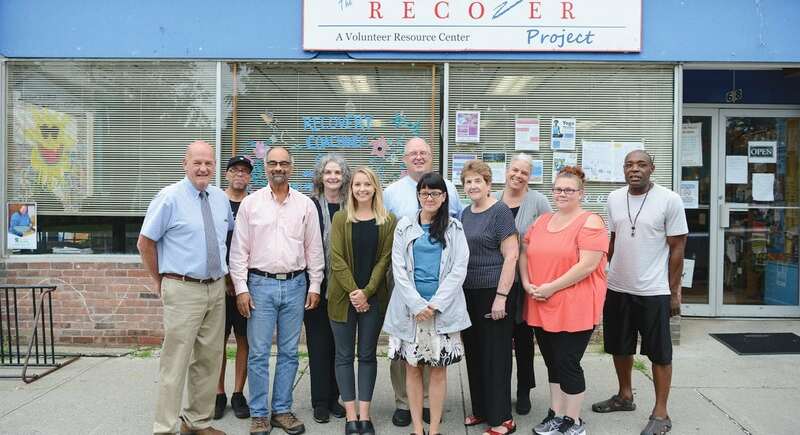 “The feedback has been really great,” she said, adding that the project’s regular clinic, housed at the Recover Project and staffed by volunteers, has brought a variety of treatments to people in need. Count Thomas in that group, and as one of the believers. “Every Tuesday, they set this up back here,” he said referring to a space within the Recover Project. “There were lights and low music and all this stuff. I remember saying, ‘what is all this?’ and walking out; it took me a while to trust and just make an appointment. 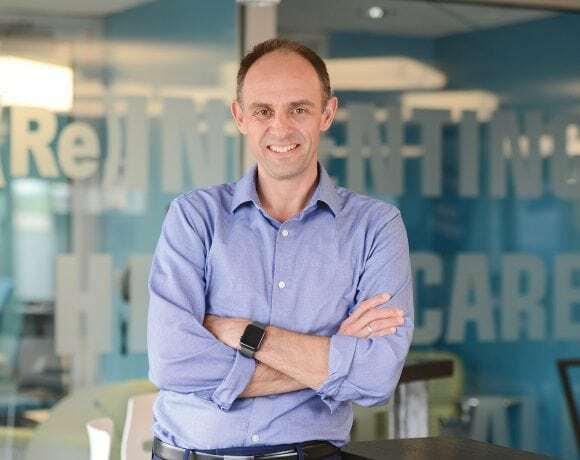 Summing up the collaboration and the progress made to date, Sullivan said the most notable change has come in breaking down barriers and putting people in the same room — either literally or figuratively. “In Franklin County, I think there were more silos than there were barns,” he explained. “This is really about good people communicating with other and working on solutions. It’s a big problem, and it still exists, but we’re seeing progress. Linda Ahern, that angry individual who started banging on doors from the outside out of frustration with a broken system, became emotional as she started talking about battling the problem from the inside — and about the progress made collectively. “I’m just really proud of what we’ve done together with all our strengths and all the connections that we have,” she said, “and to really welcome people with lived experiences, and not in a token kind of way, but in a ‘your-voice-really-matters’ way. Those involved in this massive collaboration don’t need such a reminder; they live and breathe it every day.